As a Telerik developer, telerik.com serves as an invaluable tool for finding answers to all of my radControl questions. From the massive repository of information in the community forums (17,800 threads and counting) to the helpful online demos (of which there are almost 600) to the over 9,400 documentation topics, I can usually find the answer I need to solve any of my problems. But sometimes I get tired of constantly opening a browser, navigating to telerik.com, and visiting the Forums or Support Center just to submit a search. Fortunately, FireFox 2 and Internet Explorer 7 (in an increasingly common show of cooperation) offer a shortcut that will make my life (and hopefully your life, too) much easier with their support of the OpenSearch format. The OpenSearch description syntax allows anyone to define a custom search provider that FireFox 2 and Internet Explorer 7 can use with their in-browser search boxes. Searching your favorite site is now a simple matter of picking the correct provider from your browser's list of providers. In my continuing effort to make your life as a Telerik developer easier, I've once again done the "hard work" for you. 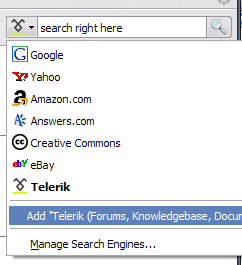 You may have noticed that when you visit TelerikWatch.com, your browser's search provider selector begins to glow (if you haven't, look now...I'll wait). I've created three custom search providers for Telerik.com that take advantage of the new and improved Telerik Support Center Google powered search: one that searches all of Telerik.com (forums, documentation, knowledge base, Code Library, and demos), one that just searches forums, documentation, and knowledge base articles, and one that just searches the forums. So add the new Telerik search providers to your browser's search provider list now and begin searching Telerik.com like a pro. And if these providers don't fit your exact needs, it's not hard to create your own provider in a matter of minutes.